Brad Pitt is a very popular brand around the world and he knows it. So does Sony/Columbia Pictures, which is why they've been releasing new posters for Bennett Miller's Moneyball with nothing but Brad Pitt front and center on them. I really loved that minimalistic baseball field poster, but these ones have less diamond, much more Billy Beane. I'm quite excited to see this, I know this adaptation has been through a lot, but all the trailers look great and even marketing like this, cheesy as it may be with Pitt front and center, keeps me hyped to see it. Take a look at two posters from IMPAwards, one Japanese, both with Pitt, below. Here are both new posters. I prefer the Japanese one below, as there's just too much green on the first one. 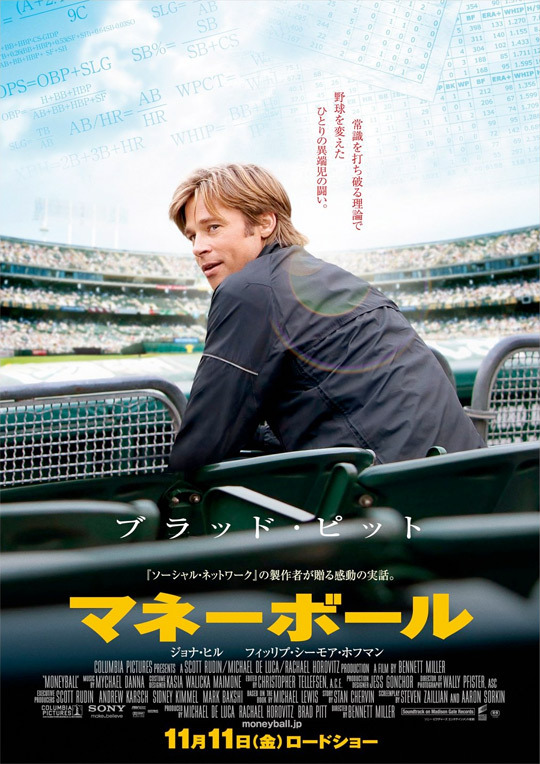 Moneyball is directed by Oscar nominated filmmaker Bennett Miller, of The Cruise and Capote previously. The screenplay was written/rewritten by Oscar winning writers Steven Zaillian (Clear and Present Danger, Gangs of New York, American Gangster) and Aaron Sorkin (A Few Good Men, Charlie Wilson's War, The Social Network), originally based on Michael Lewis' nonfiction book. 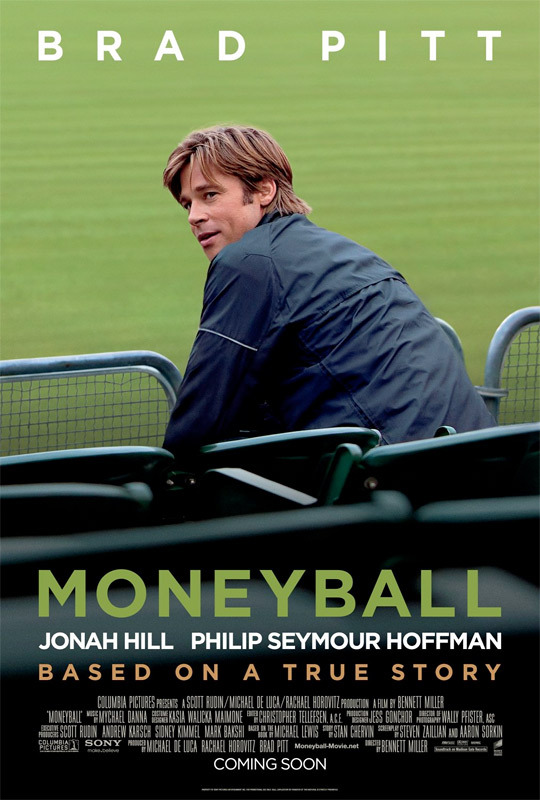 Columbia Pictures will be bringing Moneyball to theaters starting on September 23rd this fall, right near the end of the 2011 baseball season. Anyone else giggled a bit when they saw the, what I assume is some kind of sabermetrics/statistics calculation, math on the asian poster? ... Don't judge me! I kind of do not understand how Jonah Hill gets second billing on this poster, especially when he is also coming out with that crappy looking movie The Sitter. he DOES look like robert redford, doesn't he? Jonah Hill gets second billing because he's the statistician who's second fiddle to the main character. hence.. second billing regardless of star power or your judge of quality.